Of all the Picasso-related questions I’be gotten, and, as an art dealer specialized in Picasso, I get a lot, that one made me laugh out loud. Regardless of your level of sophistication in the art market , you probably have a sense that a dollar won’t buy you a real Picasso. But you may be surprised to learn that many beautiful, real Picassos are quite affordable, especially original prints. At the time of this writing, although a few original Picasso prints sell in the six and low seven figures, most sell in the fours and low fives. Some are even priced under a thousand. How can this be? After all, Picasso is widely collected by individuals as well as by museums and corporations. He also happens to be the dominant artist in the original print market, which is the focus of most Picasso collectors. Picasso’s prodigious output provides a clue. Simply put, at over 25,000 different original works, he created more works of art than any other artist in history. Of these, there are about 2500 different original prints and over 600 editioned ceramics (i.e. ceramic designs produced in multiples), which, at an average edition size of around 75, yield over a quarter of a million pieces of art. As you can see, original artworks by Picasso are rather plentiful. At the same time, due to their typically very small edition sizes, moat spacific prints are rather rare. Of course the numbers of original Picassos in circulation are steadily diminishing as more of them enter museum collections, never to exit again. The ravages of time and of the elements also take their toll on his works, further diminishing their availability as well as the condition of those that are left. Most Picasso prints were published in numbered editions of fifty, with typically around fifteen unnumbered artist’s proofs. A handful of his prints were published in unsigned editions in the low thousands, and some original posters and ceramics in the low hundreds. Picasso’s most famous series, the group of 100 prints which constitute The Vollard Suite, appeared in an edition size of about 325. But these are the exceptions to the rule. The edition size of fifty, typical of the vast majority of his prints, is miniscule, and it is one of the factors that make his prints all the more collectible. Knowledgeable collectors consider an edition size of even 325 as small, given the comparatively large print editions of some other prominent artists. Original Picasso prints are so hotly sought after that they constitute the plurality of sales of original fine art prints, both in terms of the number of prints sold as well as the amount of money paid for them. Picasso print sales comprise around 20% of the number of modern prints sold, and around a third of their combined dollar value. Presumably many more potential collectors would love to own a real Picasso, if only they realized that it was within their grasp. Just as the quantity of Picasso’s output is unrivaled, the number of books about him is also unprecedented. More has been written about Picasso than about any other artist. By far more details of his life and art are available than of any other artist. (There are also many more photographs of Picasso than of any other artist.) So why, you ask, do we need yet another book about him? Picasso’s prints have been exhaustively catalogued in tomes called catalogues raisonnés, the French term for reference books cataloguing either all of an artist’s work or work in a particular medium. However, such volumes generally provide little additional information other than technical and edition details. Selections of Picasso’s prints have been presented in the catalogues of a number of museum exhibitions. Although these catalogues often include introductory discussions of Picasso’s prints and printmaking, their typically flowery Continental prose and deep excursions into unconvincing symbology would seem to have limited appeal for English language readers. One notable exception to the rule is Betsy Fryberger’s Picasso: Graphic Magician, which suffers from neither of these drawbacks but is limited by the small number of prints in the exhibition, at least relative to Picasso’s large output. Beyond exhibition catalogues, I know of only one published attempt at a scholarly discussion of his prints, namely Lisa Florman’s Myth and Metamorphosis: Picasso’s Classical Prints of the 1930’s, an excellent read that has unfortunately received little attention. Perhaps its scope is too limited and its focus too academic to interest the general Picasso lover and print aficionado. The fine art market is quite treacherous, as you will see. Also, it often seems unassailable to wary novice collectors. Others, to whom it should seem more unassailable, nonetheless dive right in and make costly mistakes. Despite the manifest need for collectors to learn how to navigate the market’s pitfalls, no guide to collecting Picasso’s prints has been written to date. This book represents an attempt to fill that void. A further limitation of the existing books is the absence of a discussion of the cost of Picasso’s prints: their cost in absolute terms (which will vary with inflation and appreciation over time) and their relative cost compared to each other (which would not be expected to vary as much over time). This manuscript will therefore rate his prints according to their comparative cost, as well as along such other parameters as their beauty, desirability, significance, and collectibility. In many instances the ratings expressed here represent the consensus among Picasso experts and collectors. In other cases the ratings, based on my personal assessment, may diverge significantly from the norm. My divergent opinions could well herald future market trends—after all, the Picasso market is rather young, in the scheme of things. Much of the following, then, are just the idiosyncratic opinions of one Picasso fanatic, albeit one with uncommonly good taste. 🙂 However, it is at least as important for you to know about the prevailing opinions in the marketplace. It will be readily apparent to you in which cases my opinion departs from the consensus, if in the five-star scale of a given print, you simply compare the number of stars in two categories: beauty and cost. The former category more closely reflects my personal taste, whereas the latter more closely conforms to the market’s. They often go hand in hand. At times, however, when the cost of the print is disproportionately high for its beauty, all other factors being equal, you may conclude as I have that the print is overvalued. Conversely, when you run across a print that you consider more beautiful than does the market, that’s when the prospects of acquisition could get really interesting. Rating Picasso’s paintings and other unique works would be a less useful exercise, because the market for them is comparatively rarified, and the buyers in that stratosphere, or their advisers, are already rather sophisticated (apart from those, of course, who buy their drawings at Costco or on eBay, or, yes, at Salvation Army). The rest of us can simply enjoy these works when we see them first-hand at museums, or examine photographs of them in coffee table books or online. For most practical purposes, there’s less of a need to concern ourselves with their price tags. But in the case of Picasso’s editioned works, there are many thousands of Picasso lovers and collectors out there, both current and future, who, judging by the many questions I’ve fielded, could use a bit of guidance. 10. Discuss the particular pitfalls of collecting Picasso prints. Before we dive right in, just a word about the admittedly rather nuts-and-bolts title of this book. It implies a practical guide to collecting, which I fully intend this book to be. It suggests, as corroborated by the many emails and phone calls that I have received, that there is an immense lack of understanding, especially among new collectors, of what is an original print, much less how to identify Picassos as original. It does not imply any sort of irreverence to the art itself, which, as you may have guessed by now, I consider in hallowed terms. Nor do I mean it to suggest that collecting Picassos, or any other art for that matter, should be about dollars and cents as a primary motivation. In my opinion, you should collect art because you love it, and because you expect it to beautify your milieu or to enrich your life with artistically unique and stunning commentary on the human condition. This book is intended for art lovers, for Picasso lovers in particular, and, more specifically, for Picasso collectors and potential collectors. A prospective client recently said to me, rather ingenuously, “OK, at least I don’t insist on a signed piece, but still I wonder if I want to buy a Picasso just because of the name.” Please, do yourself a favor: don’t buy the name—buy the art. Just as I don’t advise someone to buy a name, much less a signature, I also don’t advise collecting as the primary purpose of investing. On the other hand, if one wishes to invest in art, Picasso, the bluest of the blue chip artists about whom so much has been written, who is so deeply ensconced in museum collections around the world, and whose art is so widely sought after, ought to be a good place to park one’s chips. 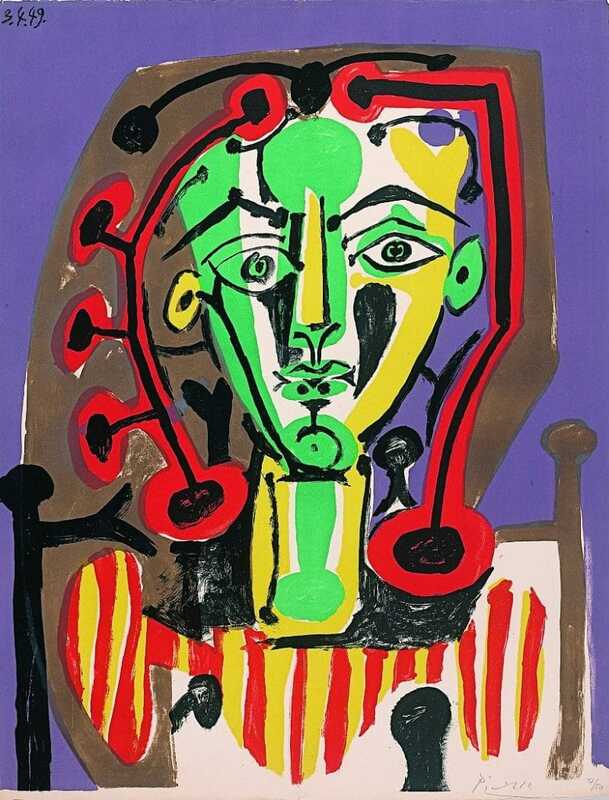 Before we deepen our appreciation of Picasso, the master printmaker, and get into the nitty gritty of collecting and investing in Picassos, let’s first find out what an original print is. This definition is really the cornerstone of an appreciation of printmaking, yet art lovers who are new to collecting stumble all over it. So let’s fix that right now.